The first beta of iOS 12.2 has seemingly confirmed plans for a subscription version of Apple News, apparently named "Apple News Magazines." Payments will be linked to a user's iTunes account, according to a landing page found in developer code. Specifically the page refers to an "Apple News Magazines Internal Seed," available to "Apple internal" users for a short time. "Your iTunes Store account won't be charged," text promises. 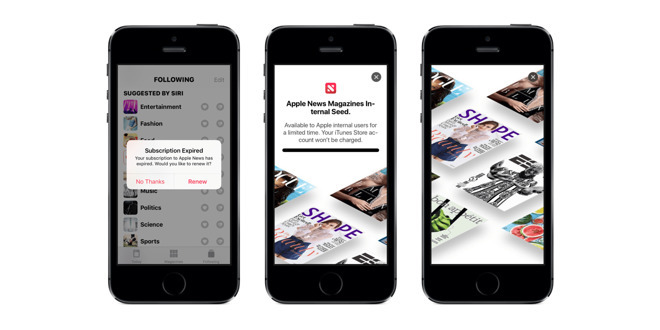 The beta also contains numerous references to a "bundle subscription," which could back reports that Apple is planning to sell a broader package combining Apple News Magazines with Apple Music and upcoming video content. Other stories, though, have hinted that Apple might make some video free to people who own its devices, at least initially. Despite its name, Apple News Magazines could include articles from major newspapers like the New York Times, the Wall Street Journal and the Washington Post. Rumors have pointed to a service debut this spring, which would be consistent with iOS 12.2's likely release date. The beta software's landing page was first uncovered by 9to5Mac.